Buy and sell livestock, feed, machinery — and more! AGW’s Farm-to-Farm Sales is our one-stop online shop for certified farmers and ranchers to place advertisements for livestock, forage or feed, farm equipment — or even to lease pasture for grazing. Open to Certified Animal Welfare Approved by AGW, Certified Grassfed by AGW and Certified Non-GMO by AGW farmers and ranchers, the service is completely free and new entries are added on a day-to-day basis. Please note: only Certified Animal Welfare Approved by AGW compliant animals or breeding stock suitable for the program can be bought and sold. All advertisements will be approved before posting. Acceptance of a listing in no way makes A Greener World responsible for the quality or suitability of the listing for the purpose advertised. If you wish to place an advertisement here, please complete the Farm-to-Farm Sales Form. There are no fees to place an advertisement. Please call (202) 546-5292 or email info@agreenerworld.org if you have any questions. These are Shepherd’s Cross Landrace Breed Sheep. We have developed this breed to live off the land, over the course of the past 25 years. They are AWA certified, and born and raised in the pasture. They can tolerate temperature extremes. Here in OK we range from minus many degrees in the winter to over 100 in the summer, with temperature changes of often 40 degrees within a few hours. They thrive on grass; pasture lamb; produce meat, milk and fiber. All Natural colors are available including white, brown, grey, golden and spotted. Some are horned and some are polled. They pasture lamb with only about 1% needing assistance. Lambing rates are around 175% (lots of twins and a few triplets); great mothers; great milkers; easy care; low maintenance. Prices start at $175 and go up to $250 each. We guarantee our sheep for 30 days from purchase date. Here is a link to additional information shepherdscross.com/SheepCattleAnimalsForSale.html. Email farm@shepherdscross.com or call Diane Dickinson at 918-231-6947 for more information or to purchase. Posted 4/9/2019. We have a nice set of moderate-framed, Angus cross yearling heifers for sale. Born spring 2018, and as of early March averaged 850 lbs. They’ll be ready to breed this spring or grow out as finished cattle for fall. These heifers come from our established group of Angus cross cows. If you’d like to see their mothers, they are on our farm too. Selling up to 12 heifers. For more information or photos, please see the TLC Grassfed Beef Facebook page and contact Annette at annette@tlcgrassfed.com or 580-366-9501. Posted 3/15/2019. Farm in Rutherfordton, NC includes 30 acres with a remodeled 3,000 square foot home, 17 acres in fenced pasture with shelters and waterers, a working cattle head gate area, a hay barn, chicken coop with run, greenhouse and 2 acre stocked pond. 70 acres of fenced pasture adjacent to the farm (leased by current owners) is also available. Owners are willing to sell animals (including Certified Animal Welfare Approved by AGW pigs), equipment and teach new owners the workings of the current farm. For more information, visit pasturtimefarm.com and contact Stephen and Julie DeMilt at info@pasturtimefarm.com or 704-453-3471. Posted 2/28/2019. One, 12 year old Longhorn/Dairy Cow $1500. For more information or to purchase, call Tom & Sue Moore of M&M Farms at 479-474-4505. Posted 2/27/2019. AWA certified Buckling, born August 18, 2018. Clean, closed herd. All adults over 1 year old are tested annually for Johnes Disease, CAE and entire herd is immunized for CD&T and CL. Visit our website, www.theabandoneddogkikogoats.com and click on the ‘for sale’ tab for pictures and more information. Price $450. For more information or to purchase, email mrsjmcullen@yahoo.com or call 336-384-1045. Posted 2/25/19. AWA certified Purebred Bucklings. One born the 5th the other the 13th of August, 2018. Clean, closed herd. All adults over a year old are tested for CAE and Johnes Disease and entire herd is immunized for CL and CD&T. More information can be found on our website, www.theabandoneddogkikogoats.com All our animals can/are registered with the National Kiko Registry. Price $400. For more information or to purchase, email mrsjmcullen@yahoo.com or call 336-384-1045. Posted 2/25/19. AWA certified NKR registered 50% Kiko Doe. Born 25 March 2016. She had a single doeling as a first freshener in August of 2018. Comes from a clean, closed herd. All adults are tested yearly for CAE and Johnes Disease and entire herd is immunized for CL and CD&T. More information can be found on our website, www.theabandoneddogkikogoats.com. Price $400. For more information or to purchase, email mrsjmcullen@yahoo.com or call 336-384-1045. Posted 2/25/19. 320-1000ac for lease. Located in Mariposa County, CA. Winter grazing lease Oct. 1st thru June 1st. $20-$25 per acre. For more information or to lease, email jesse@fouchfarms.com. Posted 2/4/19. Dexter cows, pairs, and heifers for sale. Also have some Dexter/British White feeders for sale. Located in Central California. Pricing $600-$1200. For more information or to purchase email jesse@fouchfarms.com. Posted 2/4/19. Beginning June 1, 2019 I will have purebred Katahdin ewe and ram lambs available for your farm. These are a hair sheep breed that sheds in the spring so no shearing! They are also parasite resistant and excellent mothers normally having twins or triples. I also will have a limited number of 3-5 year old ewe’s for sale. Pricing starts at $200. For more information or to purchase, email moonlightfamilyfarm@gmail.com or call 541-972-1903. Posted 2/4/19. We are taking RESERVATIONS for kids that will be born this spring. AWA Purebred alpine and hybrid alpine/toggenburg dairy goat kids for sale. Kids have not yet been born. They are due mid-March through April and would be available at one week old. We require a deposit to hold your reservation. Price to purchase: Males $80, Females $175. (Deposit $40 males, $75 females) Please contact us by emailing creeksidefarmathens@gmail.com to discuss reservations. Additionally, we will have weaned kids available in late summer-fall ($100-250). We have had no incidence of CAE or CL to date. Our original herd started with registered ADGA goats, but we have not found it worthwhile to continue registering kids. We do not disbud (remove horns from) our animals. Posted 2/4/19. Certified Grassfed by AGW and Certified Animal Welfare Approved by AGW. 9 head registered katahdin ewes. 7-9 months old – 80 to 90 lbs, ready for breeding. $400 each. For more information or to purchase, email Janet Sampson at sampsonfamilyfarm@gmail.com. Posted 2/4/19. Seeking Certified Animal Welfare Approved by AGW finished lambs, at least 100 lbs. Central Grazing Company in Lawrence, KS is seeking to purchase Certified Animal Welfare Approved by AGW finished lambs (at least 100 lbs.) to be sold under the Central Grazing Co. brand in retail locations throughout the country. Please contact Jacqueline Smith at jacqueline@centralgrazingco.com for more information. Posted 1/16/19. Open Heifers for sale – AWA certified by AGW. Low maintenance pasture-raised and ready to breed. Thirty medium sized heifers available. Pasture-raised grassfed Black Angus born Fall 2016. These heifers have daily supplementation of apple cider vinegar for gut health and have been raised on a nutritious variety of pastured oats, kale, legumes, radishes, winter peas and grasses. Contact Susan@peachcrestranch.com or call 580-618-8330 for inquiries. Price negotiable. Delivery available. Posted 12/6/18. Dexter Bull – a beautiful bull with a wonderful nature. He is register-able. We will supply all the paperwork to register him. We need different genetics, and this is the only reason we are selling him. He is a great young bull. His father is a wonderful proven herd sire. HC Cold is the registered name of his sire. We love the horned Dexters. They are able to protect themselves from predators. We have been raising horned Dexters for over a decade. Wonderful temperament, great milkers, easy calving, great mothers. Price $999. For more information or to purchase email farm@shepherdscross.com or text 918-231-6947. Posted 12/3/2018. Dexter Bull -beautiful bull with a wonderful nature. We have had him for 4 years, and simply need to get some new genetics in our herd. We have been raising horned Dexters for over a decade. Wonderful temperament, great milkers, easy calving, great mothers. Price $1499. For more information or to purchase email farm@shepherdscross.com or text 918-231-6947. Posted 12/3/2018. -4.5 years old, very docile, has never crossed a fence (even single line of polywire). Price $2000 OBO. For more information or to purchase call Micah Wiles at 606-875-0512 or email wilesmicah@gmail.com. Posted 11/27/18. We are looking for 20+ 2019 spring piglets within 3 hours of NH. We will also consider quality bred gilts. Contact Christine at Templeton Family Organics by email at templetonfamilyorganics@gmail.com or phone at 781-316-5067 with more information and pricing. Posted 11/8/18. We purchased this stainless steel refurbished bulk tank from Ulmer’s Dairy Supply and had it shipped out to CA a few years ago but never ended up using it. We were planning to mount to trailer and license as a transport tank but never got around to it. It is ready to be used by your business for milk, wine, fermentation, beer, cider etc. Price $3600. For more information or to purchase email home@weirauchfarm.com. Posted 11/7/18. I would love to purchase your Certified AWA by AGW hatched Toulouse goslings, or hatched, sexed chicks, to add to our Certified AWA by AGW certified laying hens and geese. Please email information and pricing to Cheryl at dragonflyfarm@wi.rr.com. Posted 11/6/18. I have cow/calf pairs as well as bulls from 1 year to 9 year for sale. WYE Angus Cattle that are AWA, Certified Organic, Registered, and BQA Certified from our farm. Price $2,200 and up. To purchase or for more information call Jim Finch of Eco Valley Farm at 716-790-3029 or email ecovalleyfarm@gmail.com. Posted 10/26/18. 15 to 18 month forage tested Angus bulls with complete performance records, pictures and videos of the bulls at Anguslive.com and also they can be seen on our website at dutchcreekangus.com. For more information contact Susan of Dutch Creek Farms at susan@dutchcreekfarms.com or by phone at 502-321-2727. Posted 10/9/18. 9 month old Blonde Mangalitsa Boar. Excellent temperament with no aggressive behavior. No lice or parasites. Fed organic feed and forage. $900. Call Paul Glowaski at 260-450-0450 or email paul@dinnerbellfarm.com for more information or to purchase. Posted 9/17/18. Select Senepol x Angus open cows, bred cows, replacement heifers $1500 +. 10 available. Select Katahdin mature and yearling ewes $275 +. 10 available. Email Noah Ranells from Fickle Creek Farm at ficklecreek@gmail.com for more information or to purchase. Posted 8/14/18. We have three heifers for sale and up to three steers. All certified Grass Fed and Animal Welfare Approved by AGW. Animals are in good health and good condition, raised with care on pasture in south central PA. Our breeding line calves easily on pasture normally without assistance. Animals were all born between May and June of 2017, roughly 600 lbs each. We’re asking 25 cents per pound (live weight) above current local market price. There is a scale just down the road. Call Matt Steiman from Dickinson College Farm at 717-713-0276 for more information or to purchase. Posted 8/14/18. We have 17 Brangus beef calves born Dec 2017 to June 2018. All are Certified Animal Welfare Approved by AGW and Certified Grassfed by AGW. About half are Certified Organic by Natures International. Most of the mothers of the calves joined our herd last fall and we have not noticed any health issues. Because some of them delivered within 3 months of arrival, their calves are not certified organic. We would like to sell to loving owners who will raise them to finished weight. Asking 1.75/lb live weight. For more information or to purchase, call Larry at Leafy Creek Farm at 210-615-9500 or email widman@leafycreekfarm.com with a clear subject line. Posted 7/31/18. We are a Certified Animal Welfare Approved by AGW farmstead goat dairy in central IL. We have 25-30 excellent quality Nubian, La Mancha and Nubian X La Mancha cross doelings for sale. All are healthy and guaranteed CAE, Johnes and CL negative. We have DHI milk records on all dams too. Asking $300/head, and willing to do volume discounts. We have a couple of breeding bucklings too-purebred Nubian and La Mancha. All of our goats are registered through ADGA too. For more information or to purchase, contact Leslie Cooperbrand of Prairie Fruits Farm & Creamery at prairiefruits@gmail.com. Posted 7/9/2018. American Milking Devon cattle for sale. The ultimate tri-purpose heritage breed of cattle. Know for the high butter fat in the milk, hardy and excellent mothering skills, easy calving. 2 Bred heifers, if transporting, must due so before June 15th. They are both due to freshen mid – late August. 1 24 month old proven bull (serviced the two above). Calm, approachable, easy to work around. 1 proven 6 year old cow with 2 week old heifer by her side. She has had some halter training and has been hand milked in the past. For more information on pricing or to purchase, contact Vincent Riva of Stark Hollow Farm by phone at (802) 734-0180 (daytime) or (802) 535-0400. Posted 4/30/18. Dorset/Suffolk/Texel cross ewes with May lambs by their sides, or separate. Buy together or separately after weanable late July. Two-five years old ewes (up to eight ewes available). Vaccinated and castrated lambs. Call Carol at Heather Ridge Farm, Preston Hollow, NY 518-239-6234 or email carol@heather-ridge-farm.com. Ewes $300 Lambs $150. Posted 4/25/18. 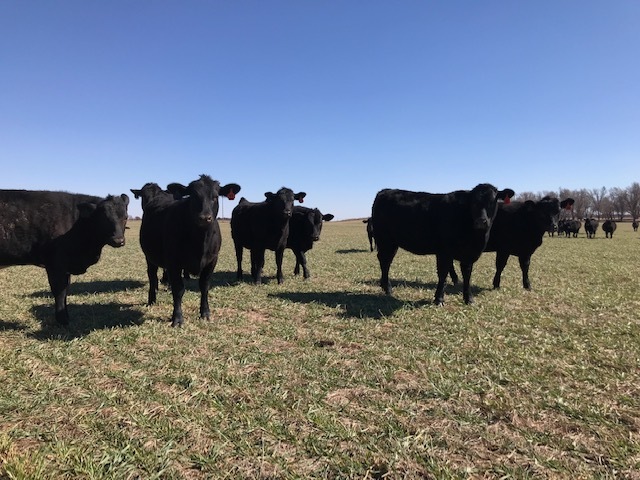 Certified 100% grassfed and AWA breeding herd for sale. 10 cows remain – two are mostly Devon genetics, 4 are an Angus/Devon cross, and 4 are mostly British White. The bull is British White, 5-years old and highly productive breeder. All are polled and all the cows are excellent mothers (those that had imperfections were culled). All should calve in May/June. They all have excellent “condition,” so culling after calving/weaning would be a money-maker. Our herd has been closed since arriving at our farm in 2014, and they have been fed only certified-organic forage, hay and salt/minerals since then. We’re asking $1,300 for each bred cow, and $1,500 for the bull. We are transitioning our operations from cow-calfto finishing feeders. Please contact Robert Fireovid and Joan Falcao of Health Hero Farm at HealthHeroFarm@gmail.com or 802-378-5246 for more information or to purchase. Posted 4/2/18. We have weaned AWA certified Grassfed hairsheep lambs for sale. Limited numbers in May/June. More animals ready in August & September. Price: New Holland Auction Price. Email Mike Sands at Bean Hollow Grassfed at mikesands1@mac.com for more infromation and to purchase. Posted 4/2/18. We have Alpine and Nubian dairy goat kids available starting in April. Our herd is disease free, we test for CAE, CL, Johnes, TB, and Brucellosis. Following AWA protocols our kids get plenty of time to spend with their mothers and learn proper goat manners. We do a combination of dam and bottle raising to keep them very people friendly. We do not disbud, kids must be paid in full if you’d prefer disbudding. Must be sold in groups of two or more. If you wish to register your doelings or bucklings we can take your information and you can pay for the ADGA registration fees. Call or email for availability. More information on our farming practices can be found on our website: https://icehousefarmvt.com/. For more information or to purchase, contact Morgan Beckwith of Ice House Farm at goats@icehousefarmvt.com or call (802) 247-1443. Price: $50 – $125. Posted 2/19/18. We are seeking 25 pullets raised on a Certified Animal Welfare Approved by AGW farm, for use in our flock of certified laying hens. Please call or email Matt Steiman at (717) 713-0276 or steimanm@dickinson.edu if you have birds to sell in the South Central PA area (Harrisburg, Carlisle, Gettysburg). Posted 1/23/18. Registered and registerable full-blood, polled and horned, black, dun and red Dexter cattle (bred cows and heifers). All animals for sale have been tested or are in the process of being tested for PHA, Chondrodysplasia, and their respective Beta Casein milk type. Prices vary from $500 to $900 depending on the above test results, age and physical characteristics. All cattle are %100 grass-fed (Certified Grassfed by AGW) and all cattle are quality animals, we just need to reduce herd size a bit. Price $500-$900. Email Roger Harris from South Chestnut Farm at southchestnut_farm@att.net or text/call (919) 539-7468. Posted 1/23/18. 2017 Irish Dexter calves, weaned and ready to go. All are ADCA registered, black and horned. 100% grassfed. Registration transfer to be completed by seller. Price: Heifers- $1000, Steers- $500. Email Mary Jane Phifer of SteelMeadow Farm at mjphifer@gmail.com if interested. Posted 11/27/2017. Wanted: AWA approved setting hens. Large reliable setters preferred. If you have laying hens that want to be mothers I want them! My AWA Delaware hens do not generally set on eggs and I need hens that do. Please call Melissa Driscoll of Seven Songs Organic Farm at (612) 584-8091 or email at m.driscoll66@yahoo.com. Posted 7/6/2017. We are looking for AWA feeder pigs and steers for our pastures and customers. I am willing to drive about 2-3 hours from Floyd, VA. We require no grain for the cattle. They would be AWA and so the whole no hormones, etc should go without saying. Happy to talk about using your farm for our production in the year 2018. If available, please email Greg Sasonov of Happy Rooster Farm at happyroosterfarm@gmail.com or call (804) 387-5175. Posted 6/20/2017. Taking deposits/reservations now for AWA and Certified Grassfed by AGW Icelandic Breeding Stock. Ewe lambs and ram lambs ready to go July 2017 from three excellent unrelated breeding rams with good AI genetics. Mama’s with lambs by their side will be available as well. Icelandic sheep are a tri-purpose primitive island breed. Known for their fantastic natural colored dual coated fleeces, their delicious and mild flavored meat as well as their dairy capacity, these animals are versatile, colorful and simply wonderful to raise. $500. Contact Vanessa Riva of Stark Hollow Farm at farmer@starkhollowfarm.com for more information. Posted 11/16/2016. St.Croix breeding ewes. Born spring 2016. Great condition! Total of 35 for sale. Great lambing season this past spring. Strong RR presence in lambs from their mothers. Nice strong size and height. Located in beautiful southeastern West Virginia. Add some new breeding stock to your growing flock. Price $350 each. Contact Tom and Debbie Gentry of SamNana Heritage Farm at (304) 661-1945 or Samnanafarm@gmail.com. Posted 10/17/2016. Commercial Grassfed Cattle. We have bred cows with calf at side. Open and Bred Heifers, Steers, Bulls.